Want some hipster action comedy featuring samurai in a fictitious past? Then look no further as Samurai Champloo is just what you are looking for! Action, comedy, and adventure- it's all there! Mugen's a buck wild warrior - violent, thoughtless and womanizing. Jin is a vagrant ronin - mysterious, traditional, well-mannered and very strong as well. These two fiercely independent warriors can`t be any more different from one another, yet their paths cross when Fuu, a ditzy waitress, saves them from being executed when they are arrested after a violent swordfight. Fuu convinces the two vagrant young men to help her find a mysterious samurai "who smells of sunflowers." And their journey begins. This is a story about love, friendship and courage... NOT! What is so funny about Samurai Champloo that will keep you entertained to the end? Well for one thing, this isn't your typical historical anime but rather more of a mixture of modern and olden style elements into one. We see here Mugen, a guy with a cool attitude and a temper that likes to kill anyone that gets in his way. He meets Jin, a mysterious ronin and instantly they get into a fight. Of course, any anime would feature a girl main character and that is where Fuu makes her appearance. Tasked with a mission to find a mysterious samurai "who smells of sunflowers", they reluctantly accompany each other as they travel across the country. During their travel, they meet many new encounters and experiences in life which they will never forget. Making friends and fighting old enemies; these guys never rest. It is pretty much all action and comedy along with some nice sword fights. The story is interesting and rather mysterious until the end. I would have never expected such a turn in events for the three of them in the end. Let me tell you about the art. It was simply stunning! The use of old art paintings style incorporated into modern abstract art simply makes this anime feel "alive". The sceneries of a historical period really was beautifully illustrated in the anime. I can't really complain about the character details as well. They all had memorable unique faces and expressions that will last in your mind for a long time. The soundtrack was wonderfully modern with hip hop and rap elements in the theme songs. They were quite catchy and humorous of its utter irrelevance to the historical time setting. One of the episodes even had some beatboxing involved which was funny and enjoyable to watch. Other than that there were also some really old style music as well as to lighten the mood in some sections of the anime. Regardless of the music's relevance, the voice acting was perfect for the characters. The trio's voice acting really suited their character representations and personalities. It was all enjoyable to watch. This anime heavily focuses on the lives of the three; Mugen, Jin, and Fuu. They are constantly quarrelling with each other or makes the silliest mistakes occasionally. They are also lawless individuals with the "police" constantly interfering with their lives. This creates much tension and anticipation in the anime. Of course, Fuu is there to keep them in check and not go wandering off doing stupid things. In the end, we see their relationships for and build up into irreplaceable trust. There are also a few other characters whom occasionally pop-up and create some sort of trouble; but it usually solved with a sword fight or two. I thoroughly enjoyed watching this anime from start to finish. I've rarely watched historical anime so this is one of the few that I have watched. I had to admit though, I wasn't sure how a comedy historical anime would work; but with ancient Japan and samurai it was well worth the viewing experience. The comdy was there and the story was quite interesting. 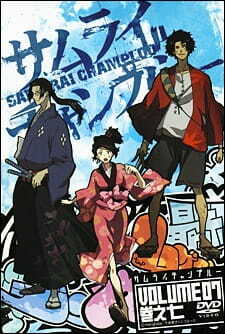 If you are into these type of anime then Samurai Champloo will definitely keep you occupied for many hours. In a broad sense it is quite linear, but the random comedy elements in this anime really makes it a enjoyable bumpy ride. Mixture of old and new can be bad. but Samurai Champloo does it right. The hip hop/rap elements in the themes songs were cool! Voice acting suited the characters perfectly. A mixture of different characters ranging from cool, calm, and collected; to utterly crazy! Was an interesting story to watch and the plot develops quite well. It was enjoyable to watch, there were plenty of funny and random moments. Notes: Second opening song for the anime Bleach. This was my first UVERworld song and I instantly fell in love with them. 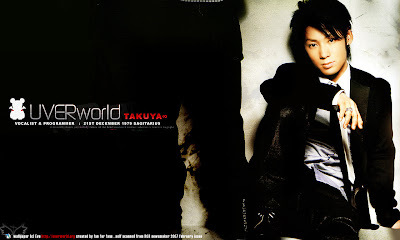 The lead vocalist Takuya looks so cute.